This statistic shows the Economic Confidence Index, created by Gallup, on a monthly basis for the ongoing year. The survey is conducted doing weekly telephone interviews among approx. 2,499 adults in the U.S. The graph shows the results for the first update each month to depict an annual trend. The Index is computed by adding the percentage of Americans rating current economic conditions to the percentage saying the economy is (getting better minus getting worse), and then dividing that sum by 2. The Index has a value between null and +100. 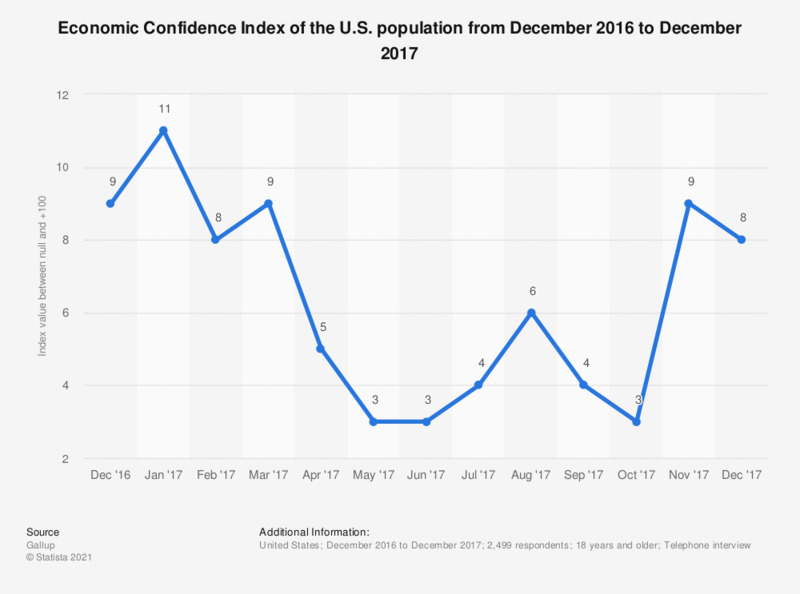 In December 2017, the U.S. Economic Confidence Index stood at 8. Gallup's Economic Confidence Index is based on the combined responses to two questions asking Americans, first, to rate economic conditions in the country today, and second, whether they think economic conditions in the country as a whole are getting better or getting worse. The Index is computed by adding the percentage of Americans rating current economic conditions (("excellent" + "good") minus "poor") to the percentage saying the economy is ("getting better" minus "getting worse"), and then dividing that sum by 2. The Index has a theoretical maximum value of +100 and a theoretical minimum value of null. Values above zero indicate that more Americans have a positive than a negative view of the economy; values below zero indicate net-negative views, and zero indicates that positive and negative views are equal. Statistics on "Gross Domestic Product (GDP) of the U.S."